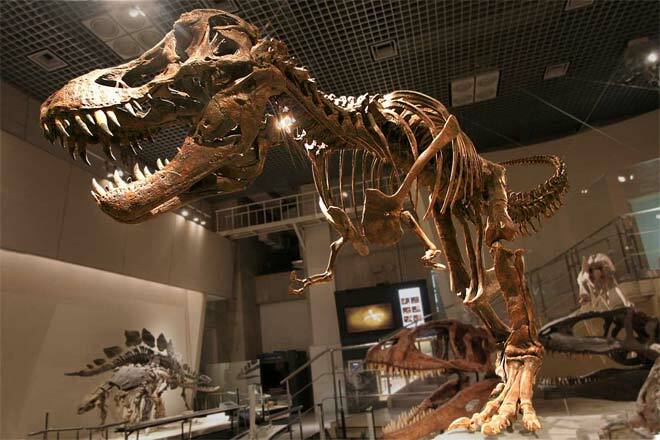 Allosaurus and T. Rex are among the most well-known carnivorous dinosaurs in popular culture. The allosaurus lived in the late Jurassic period, 150-155 million years ago. The T. Rex lived during the upper Cretaceous Period, around 67 to 65.5 million years ago, and was among the last species of dinosaurs to live before their mass extinction. In spite of allosaurus predating tyrannosaurus by millions of years, significantly more allosaurus specimens have been found. Both were bipedal dinosaurs but the T. Rex was larger and significantly heavier. T. Rex had very short forelimbs (arms) while the allosaurus had longer arms. Biped Bipedal powerful tail allowed it to move quickly; could run up to 25 kmph. Typical walking speed of about 5 mph. Its legs were extremely big and powerful. Carnivorous Carnivorous; preyed on armored herbivorous dinosaurs, other T. Rex, scavenged. More than 150 Allosaurus specimens have been found. Partial skeleton found in 1902. More than 30 partial Tyrannosaurus specimens have been found since. Over 30 specimens exist. Allosaurus /ˌælɵˈsɔrəs/ is a genus of large theropod dinosaur that lived 155 to 150 million years ago during the late Jurassic period. The name Allosaurus means "different lizard". Tyrannosaurus is a genus of coelurosaurian theropod dinosaur. T. rex, is one of the most well-represented of the large theropods. Tyrannosaurus lived throughout western North America, on what was then an island continent known as Laramidia. 1877 Teeth from what is now documented as a Tyrannosaurus rex were found in 1874 by Arthur Lakes near Golden, Colorado. T. Rex adults were a significantly larger compared with allosaurus adults. An allosaurus adult was between 8.5 and 12m in length (28-39 ft), while the average T. Rex adult was about 12-15m long (40-50 ft). The average height of an allosaurus was 17ft (a little over 5m) while T. Rex was about 23ft (7m) tall on average. The T. Rex was also substantially heavier at 14,000 lbs compared to the allosaurus at 4,000 lbs. Allosaurus lived in the Jurassic period, 150 million years ago, while Tyrannosaurus Rex lived in the Cretaceous period, 65 million years ago. The Triassic, Jurassic, and Cretaceous periods were not originally designed as a method to keep track of when certain dinosaurs lived, bur were marked by geologists as a way to distinguish between different types of geologic strata; given that dinosaur fossils are embedded in these rocks, paleontologists associate dinosaurs with the geological period in which they lived. The breakup of Pangaea started during the Jurassic period and continued through the Cretaceous period, considered to be the last portion of the age of dinosaurs. No great extinction separated the Cretaceous from the Jurassic period, though the Cretaceous period saw an increase in flowering plants and diversity of insects, it remained largely the same as the Jurassic period in terms of flora, but started to show an increase in varying life forms that would make up the large part of the next era. There are those who insist that Tyrannosaurus was a scavenger, while there are others that state Tyrannosaurus ran down and killed its prey, however in spite of this debate, there is no question that Tyrannosaurus was a carnivore. Unlike Tyrannosaurus, Allosaurus has no debate about its eating habits, and is seen and accepted as an active predator of large animals, given injuries found on Allosaurus fossils themselves. The average Tyrannosaurus lived to be approximately 30 years old, based on bone evidence provided in fossil remains. Allosaurus is estimated to have a life span of approximately 25 years, given evidence in the fossil record. Tyrannosaurus are best described as large, bipedal, carnivorous theropod dinosaurs that possess tiny arms and powerful legs and torsos; they have numerous sharp teeth. There was a prior debate regarding sexual dimorphism in Tyrannosaurs; however, this is now seen as geological dimorphism and not sexual. Allosaurus may also be described as large, bipedal, carnivorous theropods, that possess tiny arms and powerful legs and torsos; they, too, have numerous sharp teeth. The Allosaurus was smaller than Tyrannosaurus, giving it increased mobility and speed. The most complete skeleton of an Allosaurus was found in 1903 by Cope; it is categorized as AMNH -5753 and has been on display since 1908. 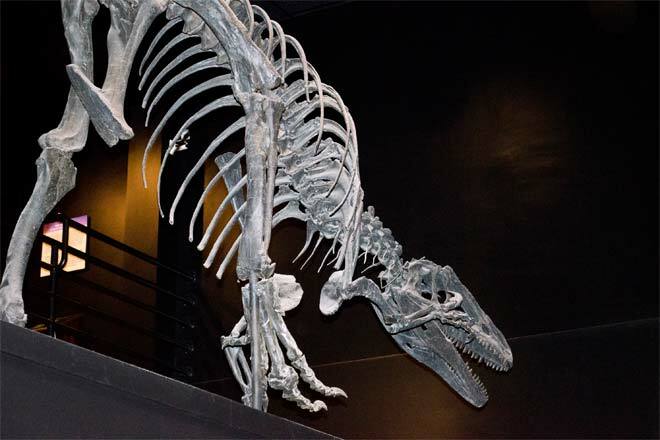 The largest complete skeleton of Tyrannosaurus Rex is categorized as FMNH-PR 2081, and is referred to as Sue. Sue measures 40 ft. long and was 13 ft. tall at the hips. 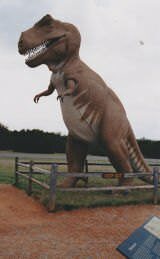 It is no contest to say that Tyrannosaurus Rex is the more popular of the two dinosaurs, having captured the hearts and minds of young children for as long as it has been known to man. Allosaurus is fairly commonly known, but is not among the list of most commonly rattled off dinosaur names; however it has grown in popularity due to its depictions in various movies and books, such as The Lost World. Tyrannosaurus Rex is the only dinosaur known to the general public by its full scientific name. 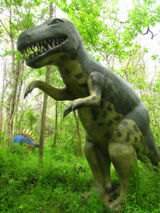 This is a video depicting a fight between an allosaurus and an tyrannosaurus. In the video, the allosaurus wins the fight. 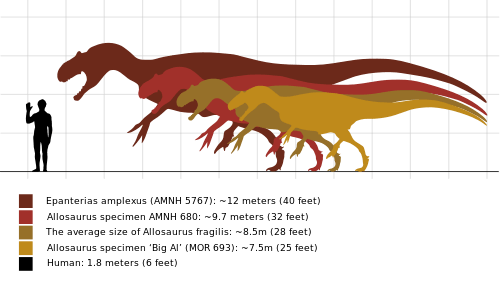 However, given the size advantage that a T. Rex would have, it is highly unlikely that the Allosaurus would win in a fight with a Tyrannosaurus.